Football should be like this more often. For an industry notorious for abrupt departures and a lack of sentimentality, it has been refreshing to observe the way in which Bradford City Football Club and its community of supporters has been able to treat the impending farewell of chief executive David Baldwin. There is a genuine sadness over seeing a good man leave for Burnley, but an acceptance that the opportunity in front of him – a move to a Premier League club to become their chief operating officer – was one he deserves and that he simply could not turn down. But instead of a brash club statement that a key figurehead had left the building, there has been a proper notice period served to ensure a smooth transition. And a chance to say goodbye. This Friday will be Baldwin’s final day at work, after seven years working tirelessly at the club. He attends Saturday’s home game with Doncaster as a guest rather than an employee. It promises to be an emotional afternoon for him. Boundary Park, Oldham Athletic on Saturday was the venue for his final match in the CEO capacity. Fittingly, he has made his way to the game by driving with joint-chairmen Mark Lawn – the man responsible for bringing him to the club, in 2007. Amidst a maze of narrow corridors in the Boundary Park main stand – which is a world away from the Etihad and Old Trafford director welcomes that Baldwin will soon be experiencing – a small unoccupied office is the setting for one final interview with the Width of a Post. To all but his immediate family, David’s proposed move to Turf Moor was kept secret until he made a final decision over his future. “I’ve always tried to make sure that things which need to be made confidential stay confidential, such as player signings, and this was no different,” he explained. “Until I was sure that it was the right thing to do and I had discussed it in full with my family, it was important that it didn’t come out as some tittle-tattle in the press. “With a lot of job positions, you tend to find that it’s a head-hunter agency that will contact you and I was approached in this way over the Burnley role. There had been a discussion with Burnley in 2012, and the position on that one was very much a case of it wasn’t the right move for me at the time. I knew that I had unfinished business at Bradford City, and the following season proved that – probably the best season in the modern era of the club. “But this time around, the circumstances of the approach, the nature of the role and the opportunity going forward – and especially given my family position, with a child on the way – I had to consider not simply what my heart said. Having decided to take up the Burnley offer, the next move for David was to inform the joint-chairmen Julian Rhodes and Mark Lawn. “The discussion about leaving initially was one on one with Julian. Mark was poorly and away from the business, so he didn’t get to hear first, he heard a couple of days later. In fairness both of them were unanimous in believing that it is a fantastic opportunity for me personally, and with the best will in the world how could they stand in my way? As part of agreeing terms with Burnley, David made sure that he was able to work a notice period at Valley Parade, and the Bantams will also be compensated with a five-figure sum of money. It is typical of the man that he made sure City’s interests are looked after, and he is quick to emphasise how important Bradford City has been to his own career. He added, “I spoke to one of my friends John Hendrie about it, once it had come out. And John summarised it fantastically well. He said ‘People will think: Dave Baldwin’s been good for Bradford, and Bradford’s been good for Dave Baldwin’. And I think that’s probably the fair way to say it. Life could have been very different for David Baldwin and his relationship with Bradford City – he might have been a player for them. On the Valley Parade books as a youngster, Baldwin had a chance of making it before his dad moved the family to Coventry for work reasons. Having set up a successful recruitment company that enabled him to retire early, David was winding down in Spain when the offer came from Mark Lawn to come to England and help his hometown club for a few weeks. Weeks turned to months, and months turned to years. Retirement is now a long way from David’s thoughts. “It has been massively life-changing,” David reflected on the last seven years at Valley Parade. “The intention was never to come in to the club and work so long. It was a six-week consultation. But the more I got into it, the more I felt that I had to offer that could benefit the business. It does become a little bit of an addiction in wanting to deliver a better product. There are so many achievements that David deserves to feel proud of. I asked him about the highlights and he reeled off a long list of things that he feels have improved compared to when he came in. “I’m really happy that we have re-engaged the club into the community – the partnerships with the likes of One in a Million and what we do through the community schemes,” he began. “We are certainly much more active in the commercial world. Maintaining the season ticket numbers is something I’m proud of. We’ve also made positive improvements to the way that we function as a football club, especially in terms of football delivery with the likes of the training ground facilities. “The training ground facilities are second to none in this league, and they mirror that of some Premier League clubs. We haven’t just gone and got top class facilities and paid top dollar for them, but forged a partnership with Woodhouse Grove. “It’s not as though we have created a training ground facility that will do for the next year or two but that we might not be able to continue to afford down the line. We are not spending any more on the training ground now than we were spending five years ago. But what we are doing is rationing and making best use of the funds that are available to us – and delivering a better product for the same money. David highlights this type of affordable and sustainable improvement as the key driver behind the way the club has progressed in all areas. He stated, “We try to improve things in a measured way. How can we deliver better, and then how can we deliver better without any extra resources? That’s what you work towards achieving. “As an example, this week we have changed all the TVs in the stadium to flat screens. That has been brokered through an advertising company that has some advertising space around the periphery of the screens. They will generate some income through selling that advertising space, and we can also have some of that advertising space. David added, “Overall I think the fan experience, the playing team, the training ground, the suite set up, and the stadium is in better condition that it was seven years ago. “There are things that we can still improve on, but those things often push costs up and if you haven’t got the ability to cover those costs you can’t magic the money from nowhere. We share information now. Not everyone likes to hear what is said, but it’s honest. You try and give clear reasons behind why you make decisions. Beyond these improvements around the club, David has also pioneered a number of initiatives such as the Supporters Board and RIASA partnership which delivered Nahki Wells. Will these be continued after he goes? “Definitely. David Dowse is going to attend the Supporters Board meeting with me this week. The Supporters Board will continue and there will be a representative from the club there during this transitional period. Once they’ve identified a replacement for myself, that person I assume will take up the mantle of continuing to attend these meetings. It’s a good vehicle and it works well. “Mark Ellis is at the forefront of running RIASA, and this week there was a young player on trial at the club who has come through RIASA. Mark Ellis is in direct contact with Phil Parkinson over this. He’s not an overseas player he’s a UK player, but we still get to hear about them. In sport there are so many ups and downs – and the last seven years at Valley Parade have certainly featured an extreme range of emotions. I asked David what his least favourite moments have been over this period, and he highlighted the challenging experience of running a Twitter account, due to his reluctance to switch off from it that caused him to be answering queries almost 24 hours a day, impacting on his home life. “Getting to Wembley and the operational side of things was fantastic, but the workload was extremely demanding,” he explained. “Around that time I set up a Twitter account to answer questions. What I found was I was answering questions at all hours and it became draining. You went into work, the next morning, not able to give your best because you were dead on your feet before you started. “You can get some very extreme comments on Twitter. Some of them got a little bit personal and hostile, which I found disappointing. That isn’t a reflection of the supporter group, and we all know that. The vast majority of supporters are perfectly reasonable nice people, but from the others the criticism did hurt me. And there was the two-year period where the Bantams’ form was so bad that there were genuine fears over relegation to non-league. David reflected, “On the football side of things, the nervousness of potentially getting relegated from League Two was the hardest point. Especially when you’re working hard to make improvements and you felt that the football side of things was out of your jurisdiction. “I was glad to see the end of the first season when Phil (Parkinson) came in and we became safe. I remember going into the stand at Plymouth away and chatting to every supporter who was there, going around saying ‘we will get through this’ – but really feeling very worried inside. Despite these darker days, David wouldn’t change them give the highs that followed them. “If someone had told me in 2007 ‘This is the experience you will have over the next eight seasons, would you want to go through with it all?’ Absolutely, 100%,” he smiled. From 1 November, David’s employment at Burnley will commence and the expectation is that he will bring many of the skills he applied at Valley Parade into the existing Turf Moor set-up. Some things will be familiar – the club also has joint chairmen – and David will work for Burnley’s vastly experienced American CEO Lee Hoos, who has had spells at Fulham, Southampton and Leicester City. “My official title is chief operating officer, so I am number two to the chief executive,” explained David. “Because of the nature of the Premier League, and to some extent the Championship as well, the workload and the demands upon those roles means Burnley have needed to introduce an additional tier. Where that takes us long-term, there are discussions around that as well; but in terms of the immediate role it is really to take the skills I have applied at Bradford and use them at Burnley. And as for where it leaves the Bantams, there is no immediate replacement for David in the pipeline but an expectation that things can continue to run smoothly without him in the immediate term. 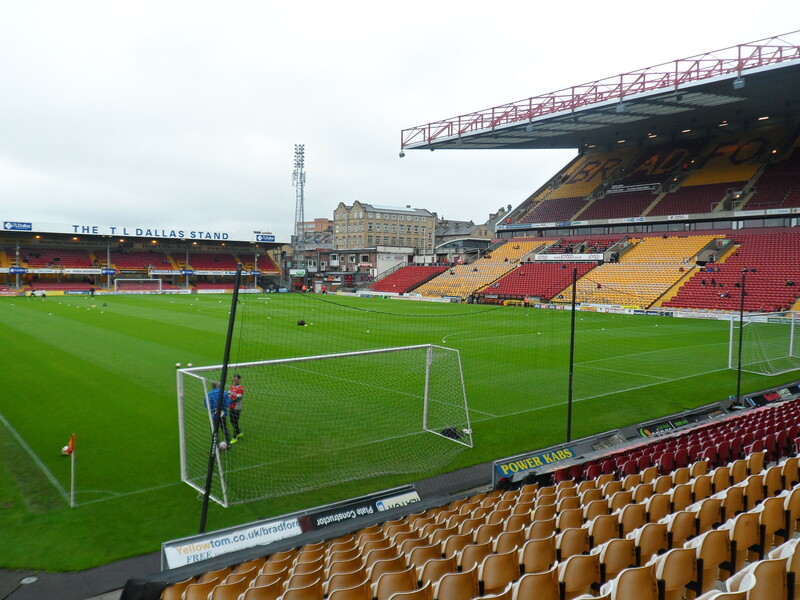 The question many supporters are asking right now is how to judge the Bradford City season so far, and what exactly are the expectations inside the club? “The marker point this season was ‘can we improve on last season?’ – that’s the key thing,” stated David. “We finished eleventh last year, but barring the first 10 games we were flirting with upper mid-table to lower. So for me, to get to a situation where we are now going into November and still very much in contact with the play offs is a case of so far, so good. “We are a versatile football team that can play different ways. When we have needed to adapt, we have adapted. Phil has been brave enough to try alternative methods rather than just stick with one approach. Everyone has their own views on diamonds, flat central fours, 4-2-3-1s, etc – but the bottom line is we have more versatility. A fair wind is indeed a possibility, but what about the risk of headwinds in January, were a key player like James Hanson to be sold? The club’s playing budget over-spend means that there is a deficit to make up and – with Tom Cleverley on loan at Aston Villa – no obvious solution for addressing it. David went through the club’s position as it stands. “Julian has made it clear that there has been an over-spend this season, of between £750,000 and £1 million, in order to give the manager a significant budget. The break-even playing budget was nearer £1.5 million and we are now pushing well in excess of £2 million. It’s not a case of we are spending loads of money on everything else. It’s about giving the manager the strongest budget possible. “The Leeds game has made a reasonably good dint into the deficit, but there is still a significant way to go. There are lots of permutations that we are looking at. We are reviewing the Andre Wisdom contract situation. He is on loan (from Liverpool) but seems to be doing well in the Premier League. The position of that contract, it can change month-by-month. We are watching closely the Tom Cleverely situation – January is a key moment for that. We’ve still got the FA Cup to come, and we’ve still got assets within the youth academy system. “We are acutely aware of the extraordinary income options that might be available to reconcile the deficit, and the sale of a first team player is the last thing on that list. We don’t want to compromise the team. “However, the objective for the club, from now until the end of the season, will be to reduce that deficit to a break-even point. So we go into next season with the future incomes fully contributing to that budget, and then if we have to give the manager more money beyond the break-even point, we can look at doing so. “Julian is acutely aware of where the position is. It is being tracked and January will be an interesting time to review it. Julian is very much hands-on. He is not a public figure, but he is aware of the situation and the options available. And the objective will be to balance the books by the summer. “This would have been resolved in one fell swoop had Cleverley signed permanently for a club in August. But it didn’t happen, and there are more permutations available to us. It feels a little strange to feel so disappointed at losing a member of the ‘back office’ but David Baldwin has always come across as a solid, honest and trustworthy person. Not that common when it comes to club representatives who interact with the fans. Best of luck in your future role David. I will also say that his presence works really well with our Joint Chairmen. The one question I would have asked him would be regarding RIASA. Has a player of theirs signed for a professional club after been turned down by us and the reasons he was turned down? Not to worry I was just typing what I was thinking really. Its just that usually we are not very good at spotting talent, the Everton of Yorkshire if you will.